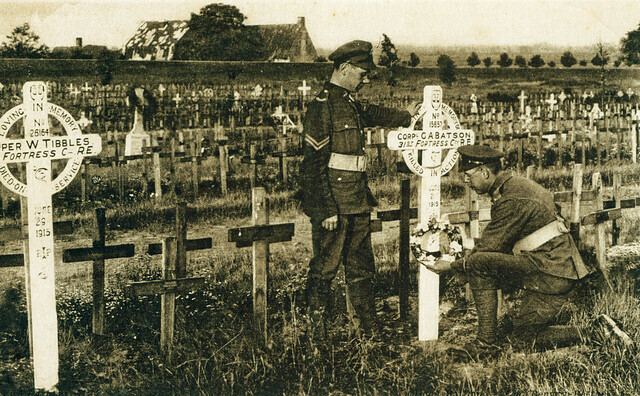 On a weekend where Remembrance is on many peoples minds, this image for once needs little description; two old soldiers, still serving, visiting a comrade’s grave at Bethune Town Cemetery in 1919. This entry was posted on 10/11/2012 by sommecourt. It was filed under France, Great War, Remembrance, War Cemetery, WW1 and was tagged with 1914-1918, 1919, Bethune, Remembrance, War Cemetery, War Graves, WW1. Would it be possible to use this photograph on the IWM Lives of the First World War Digital Memorial – please advise with credit & copyright information if acceptable to do so. No problem, just credit it to this site as I have the original image.